WWE recently filed to trademark the term “Skull King” for use on merchandise. The trademark was filed on Wednesday, March 6th. A followup trademark was filed, also for “Skull King,” on Thursday, March 14th. 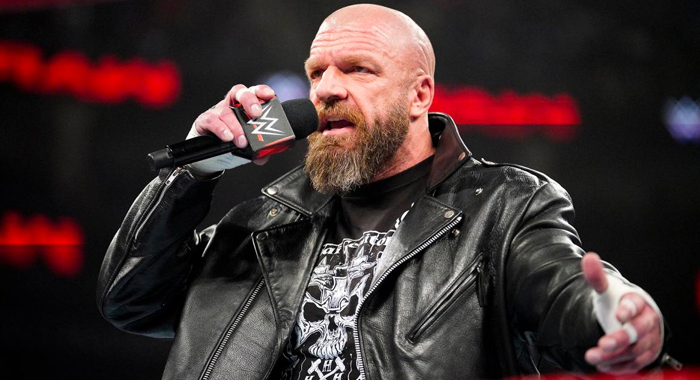 “Skull King” is like a new nickname for Triple H, who is set to face Batista in a No Holds Barred Match at WrestleMania 35. Entertainment services, namely, wrestling exhibitions and performances by a professional wrestler and entertainer rendered live and through broadcast media including television and radio, and via the internet or commercial online service; providing wrestling news and information via a global computer network; providing information in the fields of sports and entertainment via an online community portal; providing a website in the field of sports entertainment information; fan club services, namely, organizing sporting events in the field of wrestling for wrestling fan club members; organizing social entertainment events for entertainment purposes for wrestling fan club members; providing online newsletters in the fields of sports entertainment; online journals, namely blogs, in the field of sports entertainment.